Obviously, I am continuing my series on parasiticides and parasite infections. To justify using my time and yours, I would like to cite a figure from an international organization that suggests that half the world's population is currently infected with at least one type of parasite. While these infections may be more common in the tropics, the fact is that if they existed in North America, the doctor would suggest that the patient is suffering from delusional parasitosis. To avoid labels of this nature, patients have to wrestle through their symptoms on their own without the help of professionals. I am going to be very bold and suggest that IF this mind set could be shifted, it is very likely that we would discover that a host of illnesses that are currently not being well managed, including many so-called mental illnesses, are due to parasites. Unlike Hulda Clark, I will not say "all" because that is a big word and just doesn't have a place in my medical vocabulary. Mercury is still retrograde and I drafted this post at the same time as the previous one on Artemisia annua — which was too long, so for the entire Labor Day weekend, I have been fussing with the segments as well as how to get the message across. There is no tidy way to classify parasites. If you pick up a textbook from a medical school or go online, there will be attempts to bring order to a vast subject, but this alone suggests that "delusional" is a misnomer. These creatures exist. The CDC web site has loads of vivid pictures, but if a patient thinks he or she is infected with one of the creatures, sanity comes into question. We can call them hookworms and roundworms and pinworms. Or, we can divide them into visible and microscopic; or, we can try to discuss them according to their behavior and preferences. Calling something a liver parasite doesn't really work for me because parasites move to where the banquets are hosted so unless you know where to look and you are looking at the right time of day, you won't find them. For example, there are parasites that hang out in the genitalia but only between midnight and 2 am and if you can get someone out of bed at that time, they are visible in ultrasound, but then they move somewhere else. Parasites have different rates of movement, different modes of propulsion, and different meal preferences. The argument that absolutely doesn't hold water for me is that some are not just benign, but they are useful. It's possible there are some garbage collectors, but when I observe blood parasites, it seems clear that bacteria perform this lowly task and parasites are competing with the host for nutrients and weakening the host in the process. Years ago, and sorry for repeating, but people forget and there are new subscribers, I plowed through 7000 pages of material on parasitology because I had just seen something on a slide left at my house. The microscopists had been telling my clients for years and years and years that the something was a symplast, but what I saw was that it broke into countless pieces, all identical in size. They grew amazingly fast and within hours had little hearts, stomachs, tails (on some but not all) and they were eating thrombocytes. This is right out of the Ebers Papyri, dated 1552 B.C. It means that 3500 years ago, this same phenomenon was recognized and treatments for it were presented in the chapters on helminthiasis. There were also references to hookworm and filariasis in this ancient manuscript. The problem, as I stated in the previous article, has been with us since the beginning of human existence on Earth. Prior to this revelatory moment, I had been toying with a notion that somehow these symplasts correlated to the amount of chemotherapy a patient had had because the largest ones always seemed to be in the patients who had undergone the most conventional cancer treatment. It goes without saying that except for the person who left his microscope in temptation's way, no one was even slightly interested in my observation. While there is practically nothing controversial about Artemisia annua beyond whether to take it as a pharmaceutical drug or in a more natural herbal form, Artemisia absinthium has been the target of passionate embrace and heated rejection since la fin de siècle. While artists like Toulousse Lautrec and Vincent van Gogh reveled in Absinthe, my favorite novelist, Marie Corelli, wrote a book on degeneracy called Wormwood (1890). Alas, this novel is not my favorite, but Corelli was in good company with Degas who shared her aversion to the vogue. So, how can one herb, an herb with a history going back thousands of years, generate such notoriety? We actually have to answer this question because this herb is the cornerstone of Hulda Clark's protocol and yet not the herb of choice amongst most professional herbalists. It does however have a place, an important place, so I want to explain this as best I can . . . without going on and on and on. 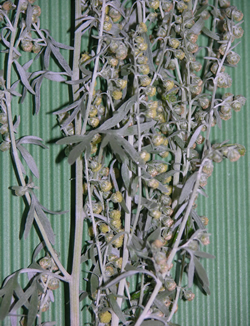 The most familiar artemisia is probably tarragon, but this one, Artemisia absinthium is the standard by which the other hundreds of other artemisias are compared. Some of you will remember that A. absinthium is one of the ingredients in the famous Four Thieves plague remedy. 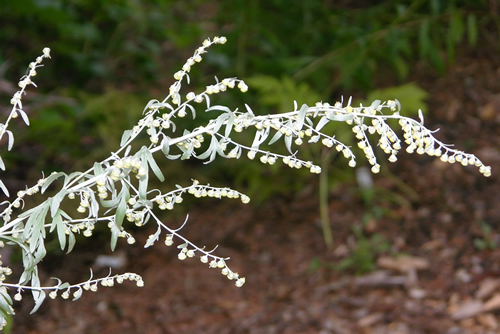 Since repetition is not always bad, I will propose that we consider that Artemisia absinthium or wormwood is to the West what Artemisia annua is to the East, but the plants are nevertheless quite different. So, to give the discussion some context and roots, let's begin with the words. We remember that Artemisia is a group of plants named after the Greek goddess of the hunt, Artemis, who is equated with the Roman Diana who gave the various artemisias to Chiron who turned them into medicine. Artemis is a lunar figure and not subjugated to anyone. The plants share this trait. They are strong, require very little care, and they have unique personalities. Absinthium is Greek for "without sweetness" or "unenjoyable", this referring to the bitterness of the herb. Metaphorical Biblical use of the word wormwood probably refers to unpleasant or bitter experiences or perhaps to poisons, such as in Revelations. Trials and tribulations can cause lamentations and suffering that harden the heart and bitter herbs were thought to evoke insight into the sentiments and heal the patient. It's therefore possible that the references to wormwood in the Bible may or may not have referred to A. absinthium but simply been used to convey the concept of future penance for present misdeeds, especially those that cause suffering. This said, there are at least four species of artemisia that are native to Palestine and environs. In the world of plants and medicine, we are seldom blessed with direct understanding of plants and their uses. Rather, we build on the knowledge of old, occasionally losing vast libraries and slipping back into darkness from which we struggle to regain our heritage. In many cultures, monasteries were the repositories for books and the wisdom sandwiched between their covers. Monks and nuns also tended the herb gardens or wildcrafted the plants and made them into medicines. Wormwood, because of its extreme bitterness, was usually made into an elixir, a liquid herbal preparation to which a sweetener has been added. My clinical experience with elixirs is that the sweetness carries the medicinal properties into the bloodstream very fast and people should not worry about the loss of the full sensation of bitterness since the tongue receptors for bitter tasting substances are different from the ones for other tastes. This is important enough that I will devote another post to it. For the moment, just keep an open mind to the possibility that adding honey to wormwood does not destroy the pharmacological action of the herb. Hildegard of Bingen held wormwood in high regard. Like the ancient Chinese, she pounded the fresh leaves (through a clean cloth) to express the juice and mixed this with warm wine and honey. It was to be consumed every third day from May to October, on an empty stomach. It improved digestion, elimination, the heart and lungs, and most of all, it relieved melancholy. She called it Vermouth and regarded it as critical to the proper functioning of all organs because it removed toxins from the arteries and elsewhere and promoted efficient elimination via the kidneys whose weakness she believed caused aging. The famous mystic recognized that arteriosclerosis begins silently until the build up of toxins leads to an avalanche of complications involving changes in the personality and vision. She called this "loins sickness" and attributed it to an accumulation of black bile, the melancholic humor. A. absinthium is exceptionally easy to grow. Some say it is hardy to zone 4, but it grows in Lapland and Siberia. It is said to prefer shade, but I see my plants "stretching" in order to get more sun. Mine are also much taller than stated in most books. They are easily as tall as I am, not the 2-2.5 ft. usually mentioned. They require almost no care and while not at all showy, they provide an interesting backdrop for plants with more color. Some suggest planting them near carrots to protect the carrots from root fly. The leaves are a bit hairy and whitish and can be harvested from the middle of summer until just about now. They should be harvested on a sunny day after dew has evaporated. Discolored leaves and tough stems should be discarded. The root is perennial and the plant will reappear in spring. The Leaves have been commonly used, but the flowery tops are the right part. These, made into a light infusion, strengthen digestion, correct acidities, and supply the place of gall, where, as in many constitutions, that is deficient. 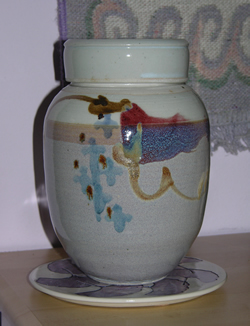 One ounce of the Flowers and Buds should be put into an earthen vessel, and a pint and a half of boiling water poured on them, and thus to stand all night. 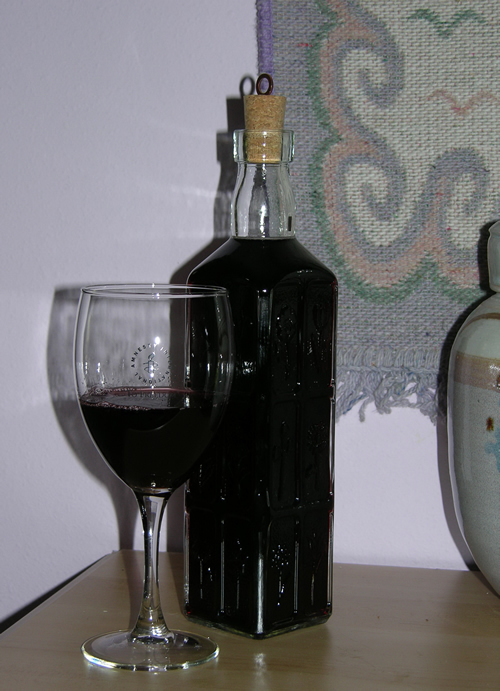 In the morning the clear liquor with two spoonfuls of wine should be taken at three draughts, an hour and a half distance from one another. Whoever will do this regularly for a week, will have no sickness after meals, will feel none of that fulness so frequent from indigestion, and wind will be no more troublesome; if afterwards, he will take but a fourth part of this each day, the benefit will be lasting. The main chemical constituent of A. absinthium is the volatile oil so the plants should either be processed immediately or dried in a well-ventilated but shaded area since the sun would cause the loss of the oils. This oil is usually green in color which is why the beverage based on this herb, Absinthe, came to be known as the Green Fairy. Like most plants, the chemical composition varies according to habitat and climate so there are plants with more azulene that yield a bluish extract or oil. This is acceptable but the aroma and other properties will be different from the greener varieties. The aroma is absolutely incredible, lots of camphor and thujone! Traditionally, wormwood was regarded as a digestive tonic and vermicide. It benefits the appetite and the functioning of the entire gastrointestinal tract. Interestingly, despite extremely bad press at the beginning of the 20th century, wormwood is regarded a nervine rather than a toxin to the nervous system. It is also regarded as a preserver of the mind. I believe that it is crucial that we come to appreciate that while certain herbs do not cross the blood-brain barrier, many parasites, spirochetes, and microorganisms do find their way into the brain. At clinically significant dosages, wormwood is not intended for long-term use. Anyone taking it regularly is advised to do so only with vastly reduced dosage. Like other professions, herbal medicine has its own vocabulary. While antiparasitic may be a broad term, vermifuge and vermicide are more specific. Vermifuges expel parasites, mainly intestinal worms. Vermicides kill parasites. The other generic term for herbs that address parasite infections is anthelmintics or sometimes antihelmintics. Some additional terms of interest are larvicidal, anticystic, etc. These refer to herbs whose specific action is on the eggs produced by parasites or the sites where the eggs are encysted. The main use for wormwood is to expel parasites, especially roundworms. It is believed that the effect is attributable to the thujone, not the artemisinin or other chemicals unique to artemisias. It's conjecture, but here we have an herb with a phenomenally long history as a vermifuge. The worms are eliminated through normal peristalsis and while stunned, they are usually still alive. A warning is in order: susceptible as children are to such infections, wormwood is not the first choice for younger patients. If given to children, it should be used only with proper understanding and the intent to use it short-term. More is not better than less when it comes to wormwood. Practically speaking, A. absinthium is usually taken as an infusion or tincture. However, as we have seen, historic uses vary considerably. The most popular form of intake has been digestive bitters, usually taken before meals to stimulate digestion and after meals to aid complete metabolism. The amount of actual herb consumed in this form is small. As a vermifuge, the amount used is greater, but the length of time used is short, not to exceed four weeks. Wormwood should not be used during pregnancy or breast feeding.